I've been having lots of fun hanging out with Oliver over this past week, I figured I might be nice and share him with you for the second week. 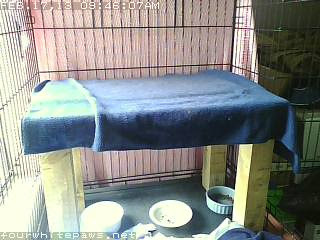 I have installed a network camera in his cage, so we can all see him from afar. He usually hangs out on the shelf (which is heated). The left side of picture is to the window. The back half of his castle is not shown on camera (his litter box, scratching post and hang out spot). So, if he's not in the video, he may have stepped out to do some business or I might be hanging out with him! At night the picture may become very low quality and even just dark due to poor lighting. what fun!! unfortunately he is not on screen at the moment, but it is nice to know it is there. I'l keep popping back until I see Oliver in all his handsomeness. Thank Cod you did not point the camera at the litter box. I get enough "viewing" at home. It seems anytime I sit at my computer, all 3 of my cats gotta go. Unfortunately, litter boxes and computer are in the same room. What a fun idea, but I'm not getting a connection. I'll try back later. Give Oliver some hugs! Nice to see Oliver, he is having a good snoozy! Pawparazi is on 24/7 !!! Ah bless him,he's snoozing...little belly goes up...little belly goes down.